Link building is an essential aspect of SEO and is extremely important in developing an online presence. Link popularity, if achieved with the right way, can be really beneficial to your site, but if not executed correctly, it can result in serious damage to your brand. That is why there is an endless ongoing discussion about the right and the wrong ways of link building. SEO is an industry that never sleeps. There are no set rules on which it functions. What it does work around is the algorithms used by search engines to rank pages. So, with every algorithm update, techniques that were innovative and effective till the previous years, become out of date. It is a tough task keeping up! This is the basic mantra that you must remember when you get down to link building. You need one way links from quality – relevant and authoritative websites. Only then will the link juice be appreciated by the search engines. Quality content was, is and will always be central to search engine optimization. Powered by relevant, informative and unique content, your link building strategy will never fail. Based on the latest algorithm updates and the resulting researches, here are some dos and don’ts to keep in mind, when you do link building for your site, categorized according to the various link building activities. The Do’s- Some said that article marketing is not effective post the Panda but that is not completely true. You have to write quality articles on your business, the norms and the latest trends. They have to be unique and up to date an informative. Then you must send them to chosen high quality article sites with your links placed well. Use important keywords as anchor text. When writing press releases, make sure that you pick company newsworthy topics to write about. Then distribute the same using industry trusted distribution resources with some links strategically placed in the body of the press release. Your press release must create some reaction ripples in the industry. 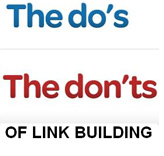 The Don’ts- Don’t spam! That is, stuff your articles or releases with lots of links. Don’t bring out a press release on mundane information, that will not interesting for anybody. The Do’s- The key here is relevancy- of the links that you are getting from other sites. Build links with high authority sites in your niche. Once the big names link to you, you will be able to build authority in your niche. Submit your links manually to the leading directories like DMOZ, Ezilon, Yahoo and Bing. Keep your link profile natural and choose from the best mix of paid and free directories. It may be difficult to initially get into these directories, but once you are in, you are good to go! The Don’ts -Do not buy links. It never helps as Google is keeping a close watch on low quality link sites, that are engaged in link farming. Getting links from irrelevant sites is also useless. Always avoid putting your site’s link on un related sites. Engaging in low quality link building can cause the Panda to hit your site and you may lose your traffic and ranking. The Do’s- Visit the relevant and authoritative sites in your niche and sign up for their forums and discussions. Even forums in your business area are equally good to start with. So, take part in discussion, post your comments, and in your signature, put your site’s link/URL. Make sure that your comment is relevant-interesting and adds to the general conversation. This will inspire the members of the forums to visit your site after reading your comments. The Don’ts- Don’t post irrelevant comments on irrelevant sites! Do not spam these forums with your links. Put your link in the signature and go slowly, or you will be banned from the discussion groups. The Do’s- Be social on platforms like Facebook, Twitter etc. Build a page and try to get links from authority names in your niche that are active on the social platform. Build a following, and interact with your followers. Inspire them to share your content and spread the word. The Don’ts- Don’t engage in blatant self promotion. Do not spam your fans’ news feed/walls with your promotional links. To Conclude- Keep these guidelines in mind while you do link building. Be genuine. Be authoritative and have excellent content. You will not go wrong.